Robert Smith was nervous sitting in the audience at Hermosa’s Second Story Theatre last Thursday night. But it wasn’t a play or a performance that was getting to him: it was a series of people making a case for their respective philanthropic organizations. 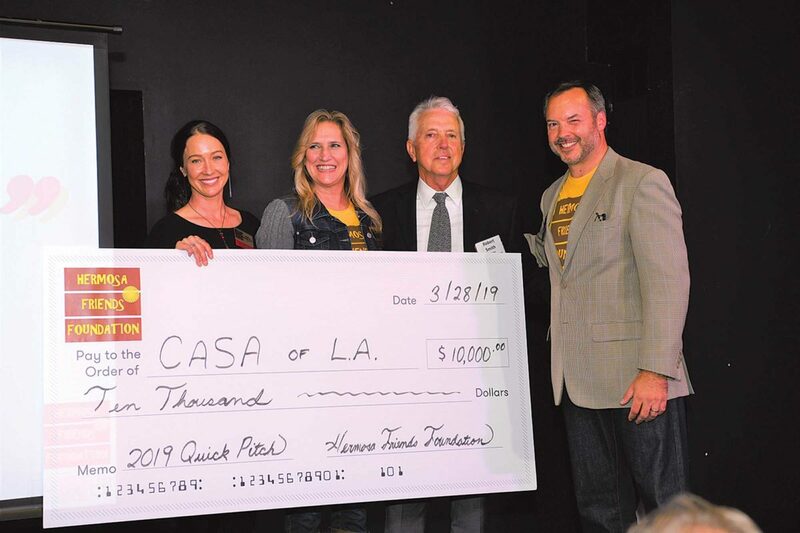 Smith, a Hermosa resident and board member of the nonprofit Court Appointed Special Advocates, was in the theater for the first ever South Bay Nonprofit Quick Pitch contest from the Hermosa Friends Foundation. A dozen local nonprofit groups took turns making a four-minute case for a $10,000 donation from the foundation. Smith’s group ultimately prevailed, but he had the unfortunate draw of going 11th. And with each person who spoke, the prize seemed a bit more distant. “I was next to last. I had to sit there and sweat bullets and watch 10 convincing presentations,” Smith said with a laugh. Learning about all the good being done locally was one of the goals behind the Quick Pitch contest, said Ryan Nowicki, the president and co-founder of the Friends Foundation. Starting in 2016, the Friends Foundation began collecting contributions from members, then pooling them and amplifying the efforts of local foundations. The “quick pitch” format can be found everywhere from philanthropy to venture capital, but it often takes place in the confines of a board room. Last week’s event began with a mixer in the historical society, allowing different groups to talk with one another. And by structuring it as an event with public presentations, the Friends Foundation sought to show the community some of the efforts that their neighbors and friends were pursuing, he said. “That was half the point: not just to hand out money to a great organization that does good work, but for all of these organizations to gain additional exposure,” Nowicki said. Nowicki said one of the things that he learned from Smith’s presentation was the way in which the problems CASA addresses happen “up and down the economic spectrum,” and that the organization has a surprisingly strong local presence. CASA currently mentors 82 children in the Beach Cities. “That was one of the nice things about all of the presentations: all of them educated us not only on their missions, but also on the day-to-day work they do,” he said. Smith agreed. He said he left the organization with a sense that his community was full of people who cared about causes beyond themselves. “Sitting there watching their presentations, everybody really made compelling points, it made me want to go support them. They not only impressed the audience, they won over their competitors,” Smith said.